We all know the struggles of not having enough room, with too many belongings but no space for them! The biggest issue with a small bedroom is the lack of storage they have, in particular clothes storage as a wardrobe can take up a large amount of room that you don’t necessarily have. Here are some smart storage solutions for your bedroom that won’t make it feel cluttered. A bed can take over a small bedroom, especially if you have a double bed. Therefore, it makes sense to have a bed with storage already built in to make the most of the space, as this also means you may not need a wardrobe as you could store clothes in the under-bed storage. Another tip would be to put winter clothes in the loft if it’s summer, and vice-versa, this will save the room under the bed for only the clothes that you need. A very clever solution to maximise space in a small bedroom would be to use the headboard as draws, this would ensure you use every inch of space available. Storage headboards aren’t just made for stashing away all of the “junk” you don’t want to be seen, storage headboards combine bedside tables and shelves but in a space-efficient way. If you still find that you need more room, you could always add little cupboards down the sides so you can stow away the bulkier items. A mirrored wardrobe will not only provide you with space and storage you need for clothes, but it will also enhance your small bedroom due to mirrors making the space feel a lot bigger than it is. Mirrors can also create the illusion of depth when they reflect off natural and artificial lighting, this will also make the room look brighter during the day as the light will bounce off of the mirror. It will also save you wall space as you won’t need a separate floor-length mirror. It is a generally known fact that the lighter the colour of the room the bigger it looks; brighter walls are extra reflective and make spaces feel a lot more open and airier, this also helps take full advantage of the effect of natural light in the room. Dark colours tend to make the room look smaller and absorb light, it has also been found a dark coloured room can have effects on your mood. The effect of soft tones such as white, cream, baby blue and pastel pink always make the room feel more inviting. A tip could be if you paint the wall trim/edge and details in a brighter colour than the actual walls, the walls will appear as if they are further away, making the room feel that little bit bigger. Limited to a single wardrobe? One clothing rail and no extra storage available? Get rid of those tangled messy coat hangers and space your clothes out a bit with some extra storage draws, with the help of the added storage draws the wardrobe will appear much neater and you will have a lot more space. 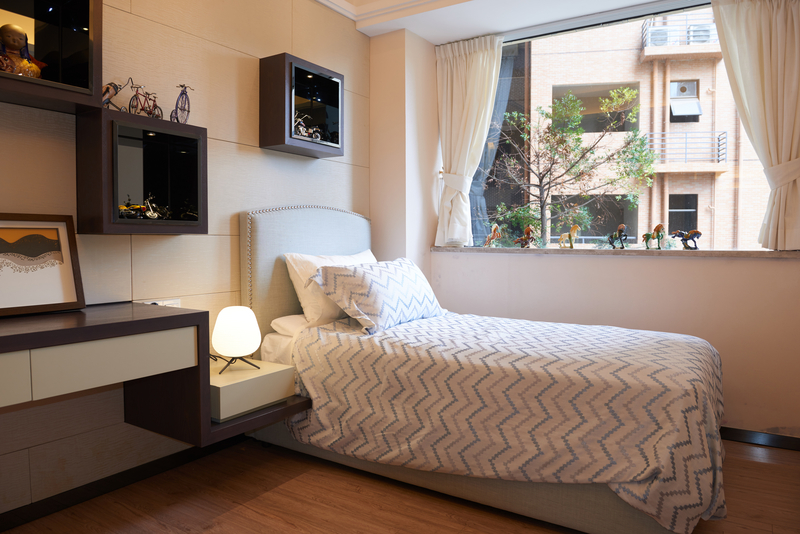 Hopefully these tips and tricks will help your small bedroom feel much bigger, if you need any further help with your bedroom fitting and storage feel free to get in touch.